The bones of Edmontosaurus annectens are the most commonly found fossils in our research site in the Upper Cretaceous Lance Formation in eastern Wyoming. Thus most of the dinosaur bones in the Museum collection come from this huge animal. 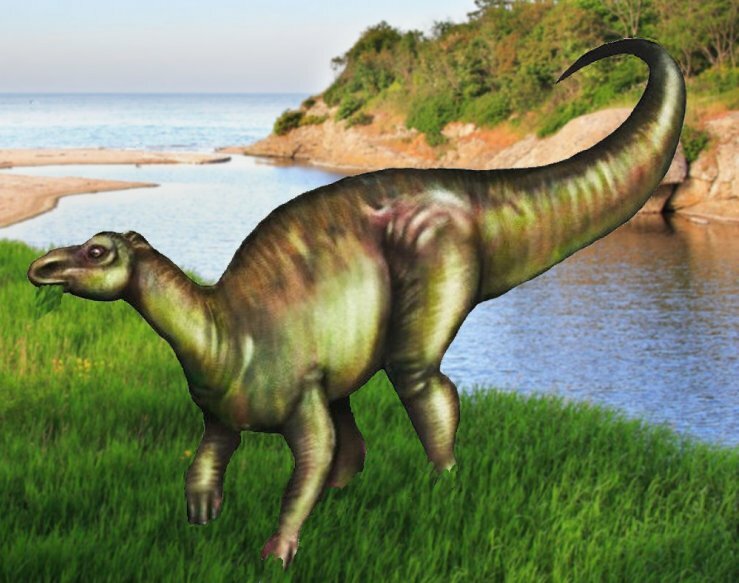 Edmontosaurus was a giant plant eating hadrosaur, ranging in size to over 40 feet (12 meters) long and weighing several tons. Pictured is the skull of Edmontosaurus annectens. Because the shape of the front of the skull resembles the beak of a duck, Edmontosaurus is often referred to as “The Duckbilled Dinosaur”. In 1999, we excavated what is probably the largest femur (upper leg bone) ever recovered from Edmontosaurus. It measured 150 cm (almost 5 feet) in length! As is often the case for us, we discovered the femur on the last day of the season, and we had to work quickly but carefully remove the bone before we left. The femur was cast in a plaster jacket and wrapped in a white sheet, then placed on the reclined front passenger seat in the rental car we were using. You can imagine what a funny sight that must have been with this huge white object that looked like a mummy in the passenger seat of our car as we drove home to Texas! Now, during a typical summer we may find three or more femora (plural of femur). Pictured is that unusually large femur, whose number is HRS00001, the first bone in our museum collection. Years of speculation on the lifestyle of the duckbilled dinosaur have done little to clarify the behavior of this huge beast. One interesting aspect of Edmontosaurus and other hadrosaurs is that most of them appeared to be without a means of defense, if you can call any 40 foot long creature defenseless! They show no evidence of body armor and do not have any obvious defensive weapons other than their huge rear legs. Although the speed of the edmontosaur when running is not known with certainty, recent estimates of up to 28 miles per hour (45 km/hr) based upon a careful analysis of a nearly intact specimen, would certainly suggest that speed was a strong suit. Since they appear to have been able to move quickly, this may have been all the protection that was needed. Estimates of the running speed ofTyrannosaurus, the most likely predator of duckbills, range from 15 to 45 miles per hour, but consensus is that if Tyrannosaurus ran at all (there are no tracks that are attributed toTyrannosaurus that indicate a running pace) , it was probably relatively slower (15 -25 miles/hr) than Edmontosaurus. It is easy to think that these dinosaurs lived in water or at least a swampy environment. Some authors have noted that the long, broad tail, stabilized by rows of criss-crossing ossified tendons (tendons that have calcified like bone – see long structures near top of picture below), would be ideally situated for swimming. 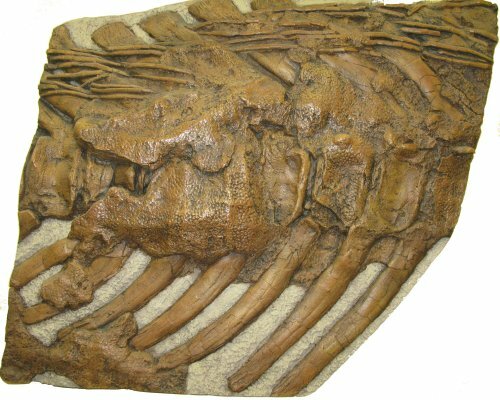 The piece of a “mummified” Edmontosaurus in the picture above also shows remnants of skin adherent to the bones of the tail. Suggestions of webbing in the feet on a recent mummified skeleton, if correct, would give support to a lifestyle in or around water.In any case, it seems probable from the life habits of other animals with flattened beaks, that the broad, flat mouth was used to gather plants that grew in water. 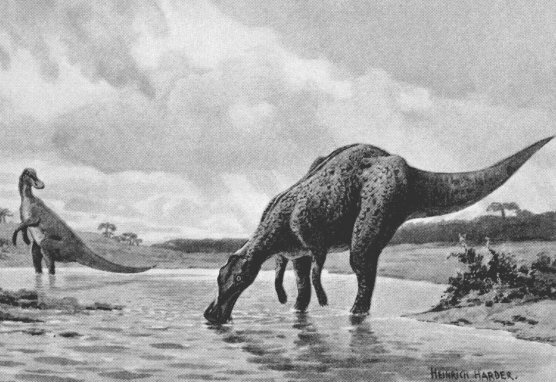 The picture done in the early 1900′s by the artist Heinrich Harder, depicting two hadrosaurs in a swampy environment may not be too far off the mark. Skip the puzzle! Take me to the museum to look at the bone collection for Edmontosaurus.